Oh what fun! Developing the red flower heads was lots of fun. I love how the greens and red act against each other and really make the focal point pop. The dark values in the shadow areas help to create the illusion of depth. I used many different reds on my palette to work around the flower heads including, Burnt Sienna, Perylene Maroon, Permanent Rose, and some Quinicridone colors. I wanted to keep the yellows glowing through some areas, so I was careful not to cover them with too many glazes or with cool glazes. 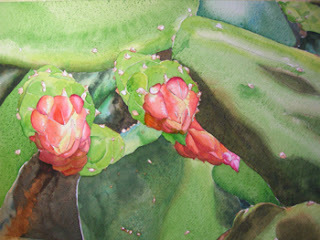 I used some Burnt Sienna and VanDyke Brown in the shadow areas around the thorns. Be sure to leave the white areas wherever you can! This just adds sparkle to the piece.